I spend a lot of time reading before I decided to do FarmFoods reviews here on Better Grills. The reason is that I only want to advise on the best grass fed and finished meat. The FarmFoods website tells their story and it seems they are very concerned to provide their customers with high quality meat at the most affordable price. In a hurry? You can find their website here! At the time of me writing this, they work with 6 farms that all raise their beef in natural way and only feed them grass or hay. When a veterinarian is needed, to give some type of medicine, the animals will be sold as regular beef and no longer as natural and grass fed. I like that Idea. I read on their website that they strongly believe in the fact that our food has become anonymous and that we should now where I food is coming from like our ancestors did. I agree with that. What meat can you buy at FarmFoods? Their Salmon is Wild Caught Alaska Salmon from the certified farm of Tony and Heater wood in Alaska. The Salmon is deep frozen right after being processed and vacuum sealed. it works fairly standard to order your beef, pork, chicken or Salmon. Shipping is done through UPS and the meat is kept frozen by using dry ice. There is enough dry ice packed around the meat to last more than 12 hours after delivery. The meat is shipped on Monday and Thursday and will arrive in 2-3 days. The delivery is most of the time done in the afternoon. Ready to find out more? You can find their store here! I thought about giving you list of all the cuts of meat they have in their store but that would take up almost a whole page, so here is short rundown. The Chicken comes are raised outside on a pasture all year around where they eat natural food like grass, bugs, seeds and worms. Added to their food is locally milled conventional grains. This is probably not a non-GMO grain. Like I mentioned above the Salmon is wild caught in Alaska and after catching frozen in fillets that are 6 – 7 ounces and individually packed. There are also a few combination packages available that contains top sirloin steak, two Salmon fillets, A whole chicken and 3 pound ground beef. After reading a lot abut the idea behind the FarmFoods store I can only say that I like their store. I like the idea that they try to keep a lean production and promotion to keep the prices as low as they can. I looked at al the farms they get their meats from and read how they thought about natural beef and could not find anything I did not agreed with . I suggest that if you like to cook some healthy food on your grill, smoker or even in your oven, to have a look their store here. 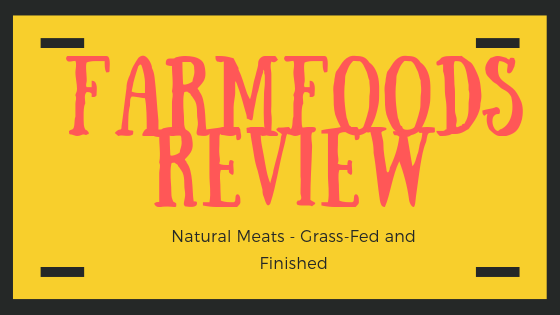 Thank you for reading this FarmFoods review and feel free to contact me with any question you have.